Smooth Inductions, P.C. 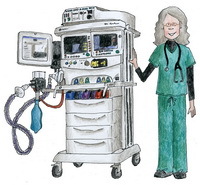 was formed to provide quality nurse anesthesia services to the folks of North Central Texas. I provide all aspects of anesthesia, including pre-operative assessment, general anesthesia, regional anesthesia, IV sedation, intra-operative management and post-operative follow up. Smooth Inductions, P.C. is currently scheduling locum tenens contracts. E-mail us with your non-medically directed anesthesia needs!